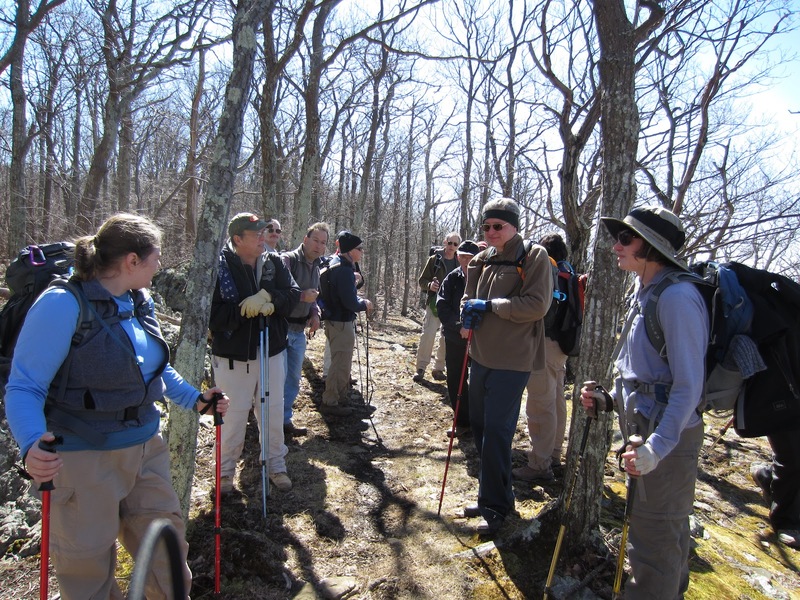 A rare photo of the hike leader. 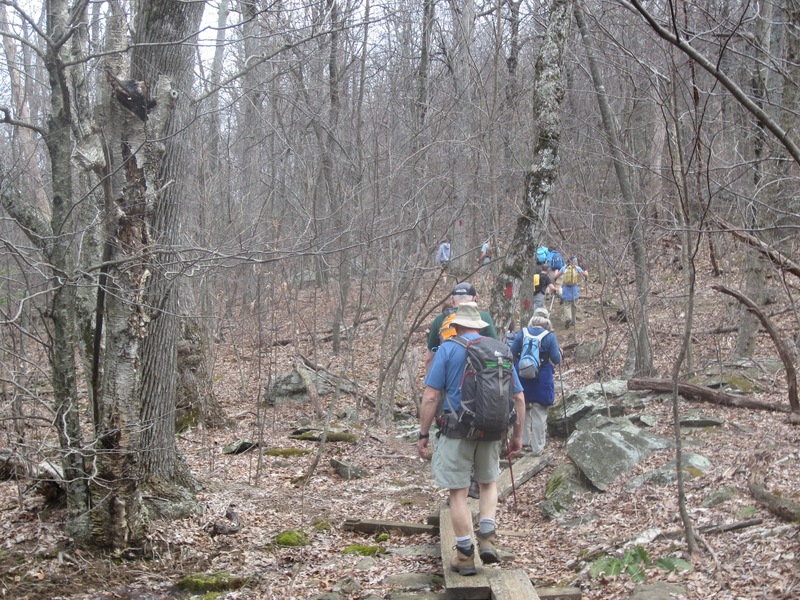 It was supposed to be a hike to Bear Church Rocks, but when hike leader Ken Moss showed up at Albemarle High School on a rainy Saturday morning, the cupboard was bare of hikers. "Hmmm," thought Ken, "maybe everyone is smart enough to stay in out of the rain," as he envisioned a hasty retreat back to hearth and home. Soon the ever dependable and reasonable John Shannon showed up and made it understood that he had similar thoughts. 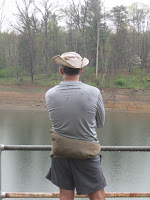 Just then, a mystery hiker showed up and made it known that he had come to hike, by golly, and he didn't want to hear any of that "but we might get wet" whining. The forecast and radar called for rain throughout the day, so John and Ken managed to convince the mystery hiker that it would be foolish to continue to our scheduled destination, which features wonderful views for lunch...but only when not engulfed in clouds and fog. So we compromised and decided to head off to nearby Ragged Mountain Reservoir for a short circuit. This was made more tempting by the thought that, due to future dam construction, it may be our last chance for awhile to take advantage of this little gem. 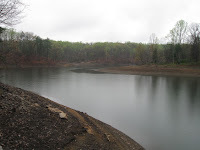 Our mystery hiker suggested some alternate routes which took us on a new circuit around the lower reservoir, and it was a pleasant stroll with plenty of new views and places to explore. 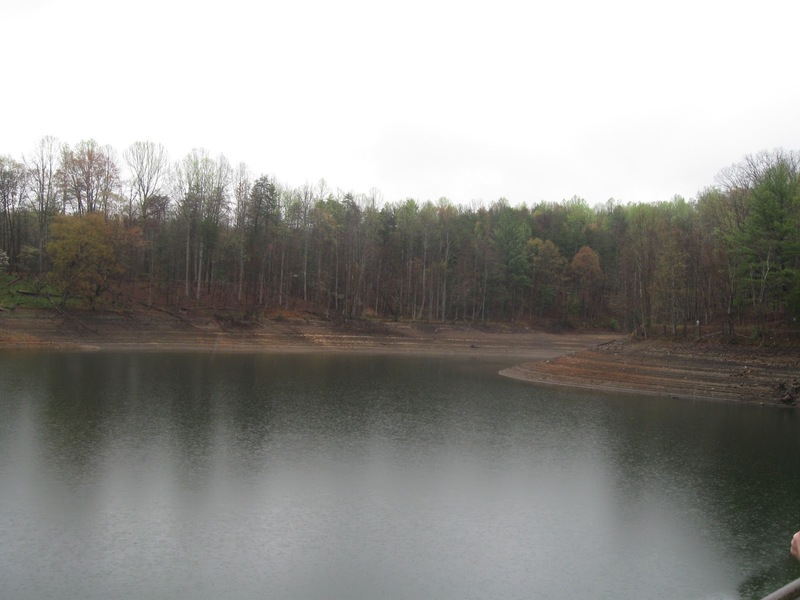 The most interesting part of the hike, though, was the water level of the reservoir, which is being drawn down for the construction project. 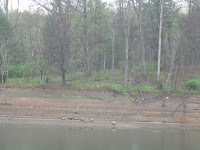 It was quite a new sight to see the barren, sloping shoreline sloping down to the much reduced water level. 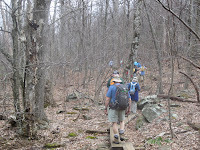 The hike of 4.5 miles was completed with ease and the small group was pleased that the dire calls for continuous rain had been false...we only had one short shower during our jaunt, remaining dry for the rest of the day. It was a successful trip after all! 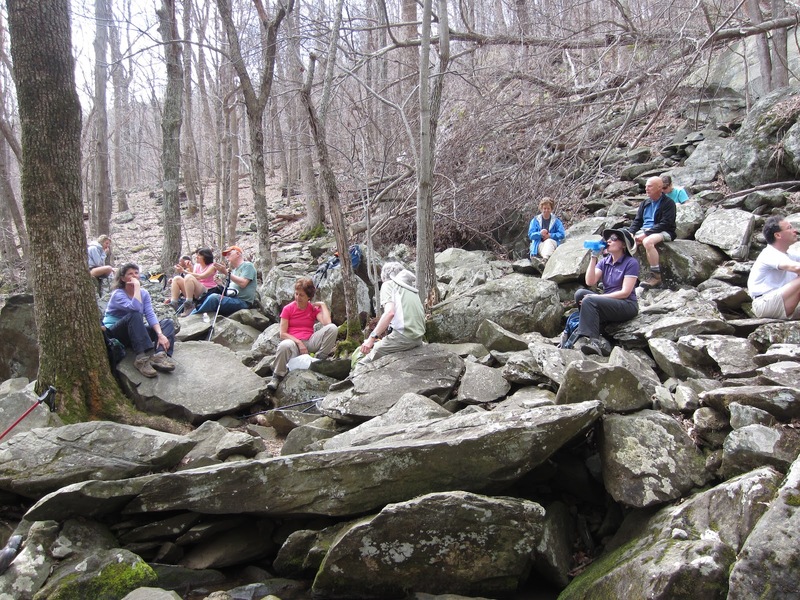 St. Patrick's Day brought forth a little different hike for the Charlottesville PATC. 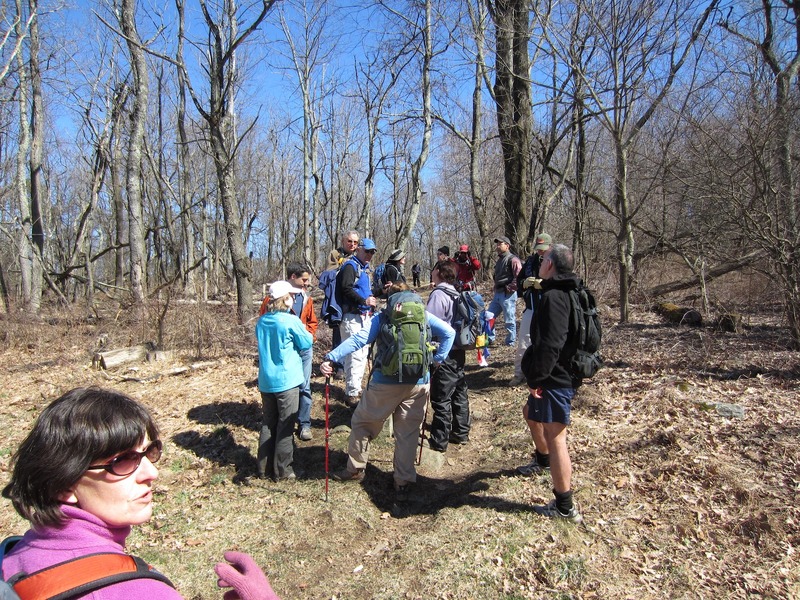 Marit Gay led 18 hikers on approximately a 7 mile hike following part of the Wintergreen Resort Perimeter Hike. 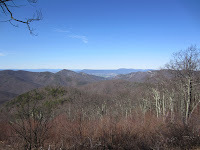 We did a point to point hike beginning at Blue Ridge Overlook and heading down the Old Appalachian Trail. 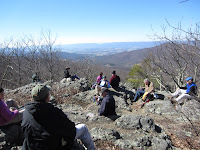 We enjoyed beautiful views of the Priest, Three Ridges, and the Shenandoah Valley. 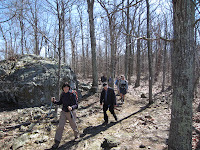 The terrain was varied (fairly graded to rock scrambles) and so was the environment from fairly remote to the trail being adjacent to houses and the golf course. 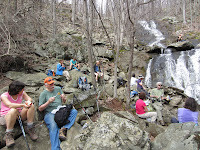 The trek followed down the Upper Shamokin Gorge Trail and settled at the Shamokin Falls for a lunch break. 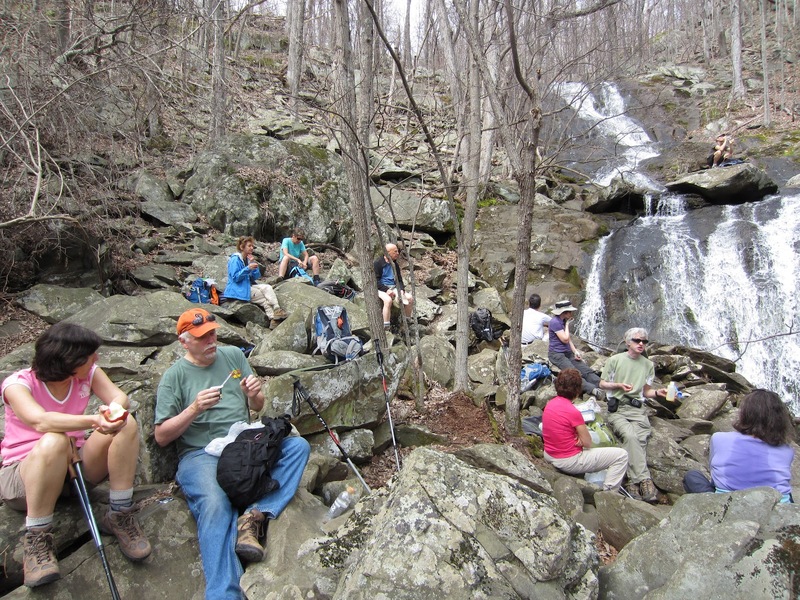 The hikers enjoyed their food on rocks aligning the lovely falls. 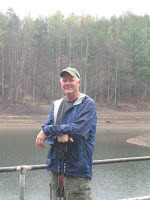 Brownies and peanut butter cookies were provided by the leader, as well as pumpkin bread donated by John Shannon. 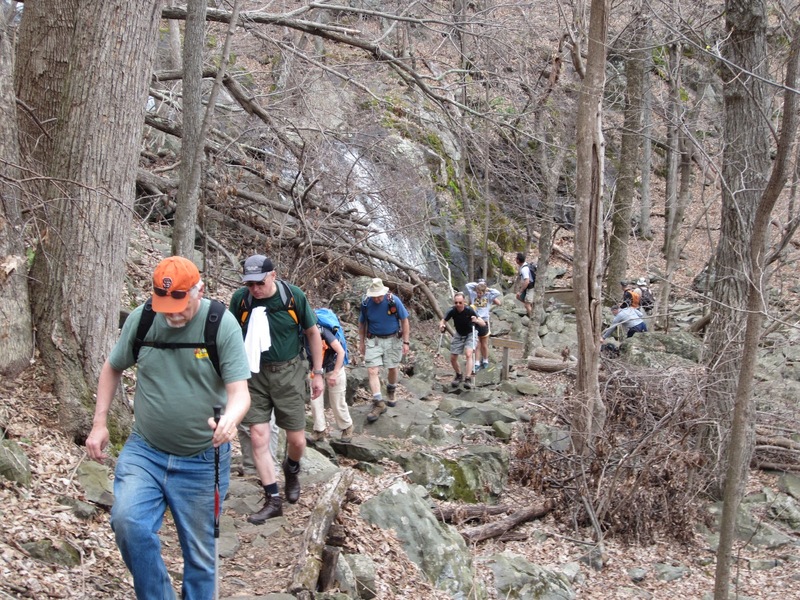 After the respite we left the Upper Shamokin Falls Trail and veered upward on the Loggers Alley Trail. 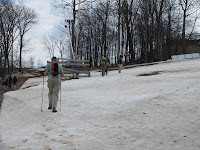 This brought us to the Upper Highlands ski slopes crossing Wild Turkey and Cliffhanger runs. 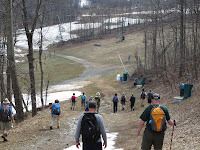 The hikers even got to traverse along the remaining snow paths until we got to the main artery of the ski mountain, Dobie run. 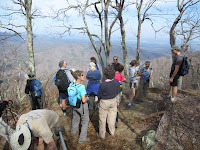 The plan was to continue on the Perimeter Trail on the Cedar Cliffs North Trail and loop back to the cars along the Hemlock Springs Trail, but some of the hikers needed to leave to return to Charlottesville and the majority of the remaining trekkers were ready to enjoy the St. Patrick's festivities at Devils Backbone Brewery at the bottom of the mountain. 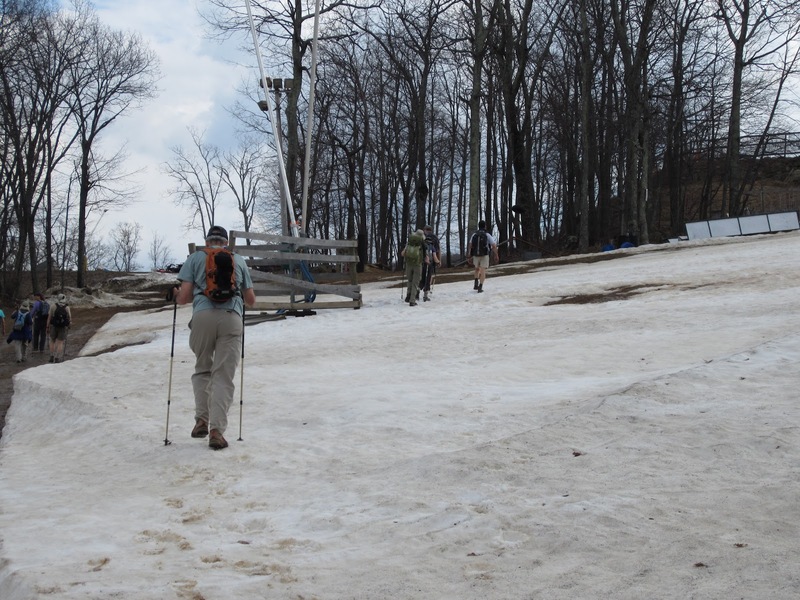 One carload of drivers was sent to retrieve the remaining cars while the others enjoyed the views at "The Overlook" along the A-Side slopes of Eagle Swoop and the Plunge Tubing Park. Delicious beer and appetizers completed the day of good weather and energetic hiking. 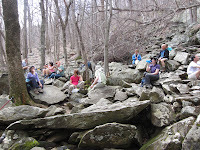 The group included Rita Kieffer, John Brandt, Dan Funkhouser, Sue Tansey, Neil McKinney, Joanne Davis, Peter Fink & Bev Maresca, Dave Borszich, John Shannon, Andy Willgruber, Barbara Martin, Marian Styles, Ken & Marie & Doug Moss, David Ledbetter, Brian Muszynski, and Corinne & Marit Gay. 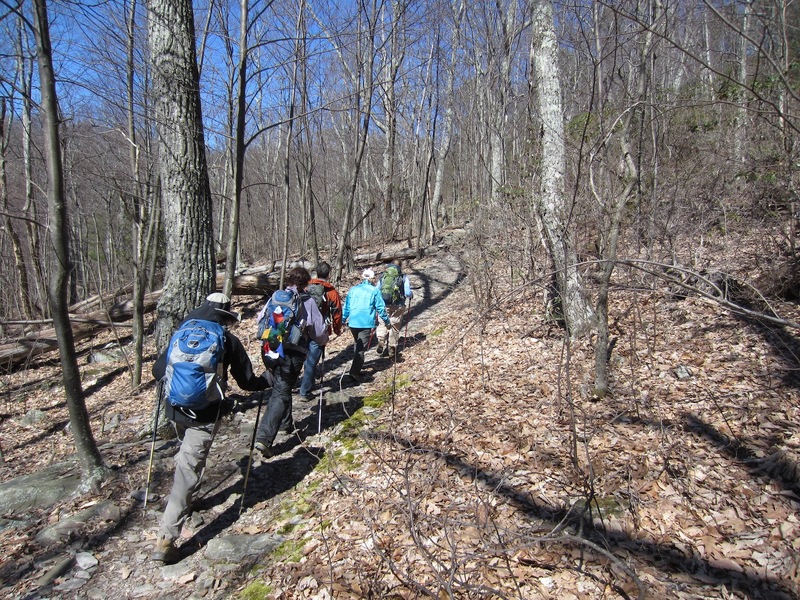 Next Stop: Pacific Crest Trail! 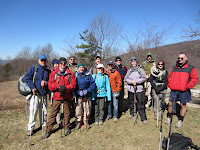 Fourteen hikers met hike leaders Andy Willgruber and Iva Gillet on a sunny and cool late winter Saturday. 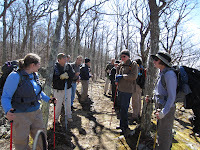 Our destination was the Appalachian Trail in the North District of Shenandoah National Park, a section not hiked in recent memory by our chapter, going from Panorama to Elkwallow Wayside. 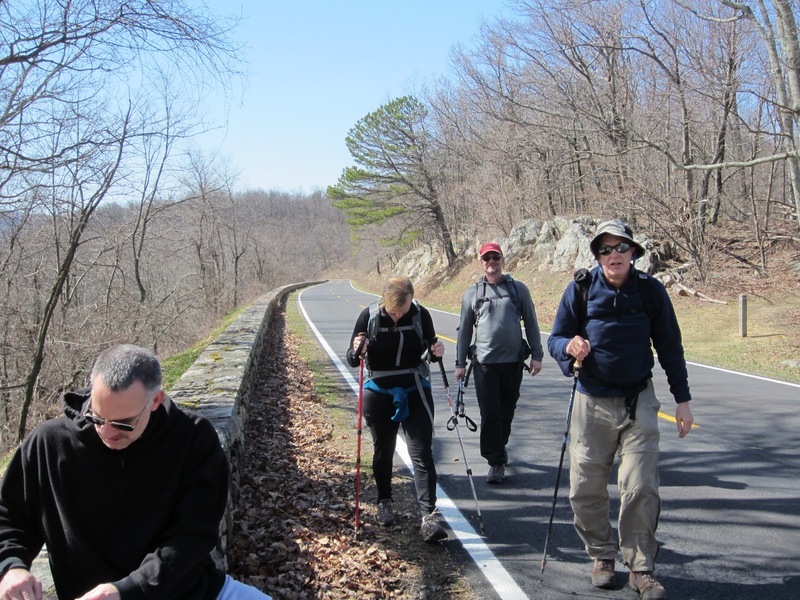 Four hikers- Dan Funkhouser, Ken Moss, Bill Holman and Dan Ralston- had racked up 8-1/2 miles with Iva the day before--and here they were, back for more! C.J. 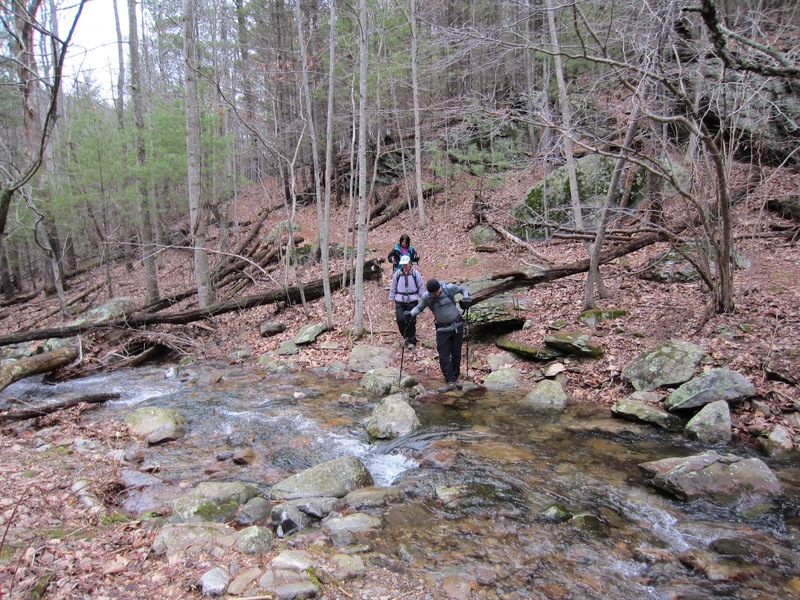 Woodburn was hiking with us for the first time. 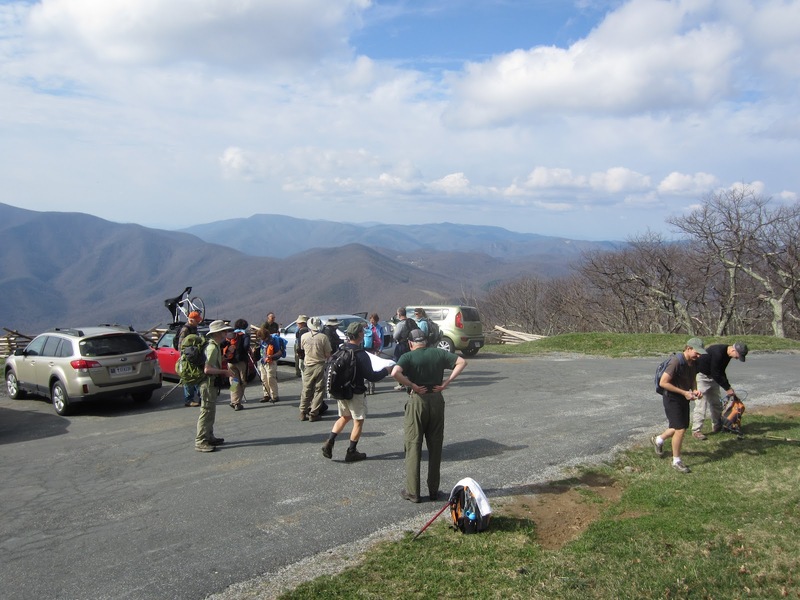 Four cars headed to the Panorama parking lot at Thornton Gap where we met Michael Seth. Lindsay Brown, who was doing a shorter "out and back" hike to Beahms Gap, returned our drivers to Panorama. After crossing Rt. 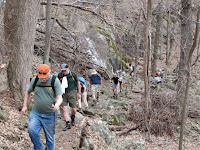 211 on the AT, we began a steady uphill climb to Pass Mountain as our morning's work. 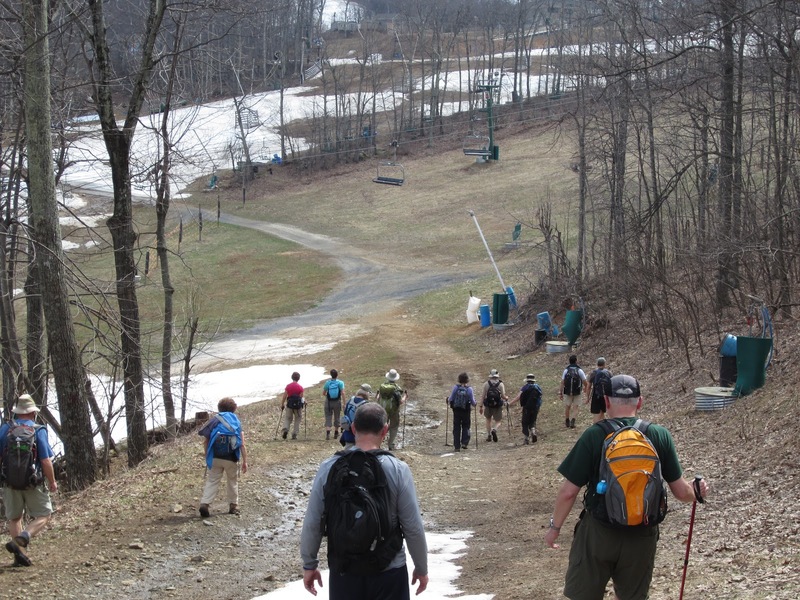 "Casualties" from the previous day's hike tended to drift to the rear. 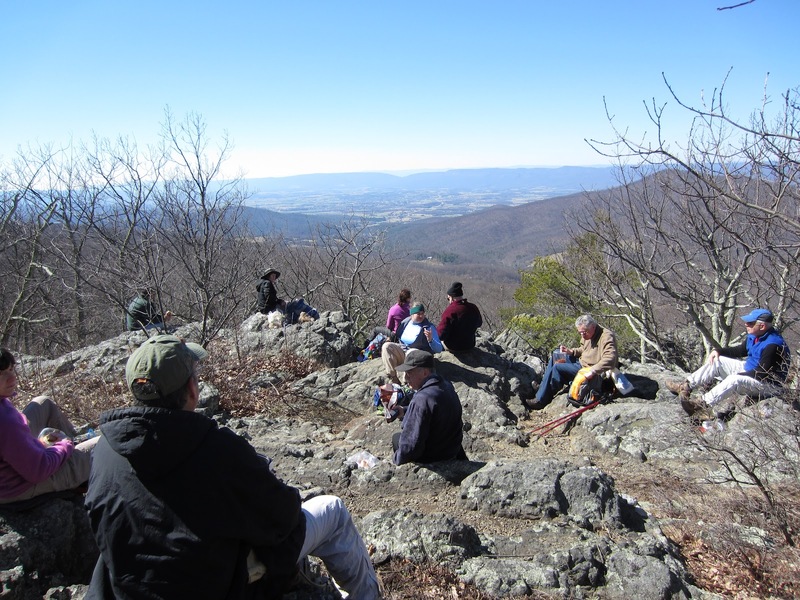 A relatively early lunch spot was chosen due to the outstanding westward view and the plentiful rock seating on the flank of Pass Mountain. 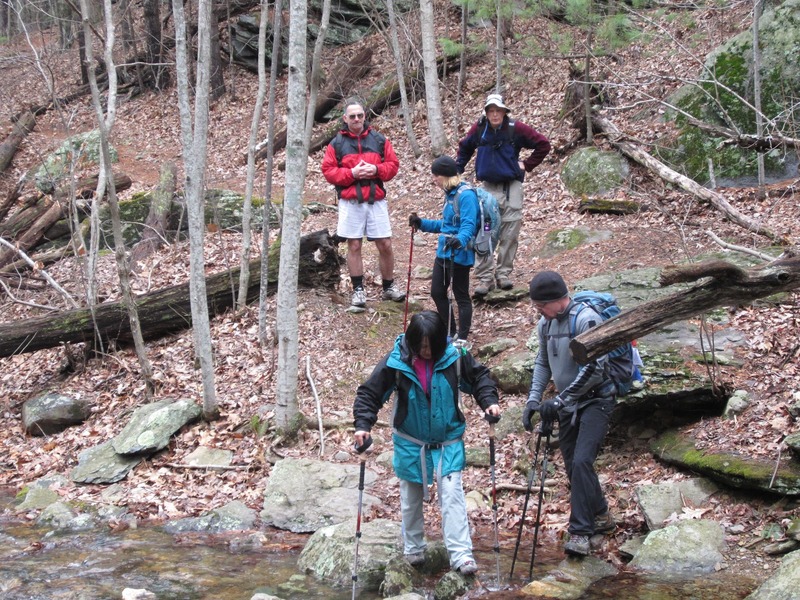 The only problem was that Dave Abdallah and Jodi Frederiksen were ahead of the group. 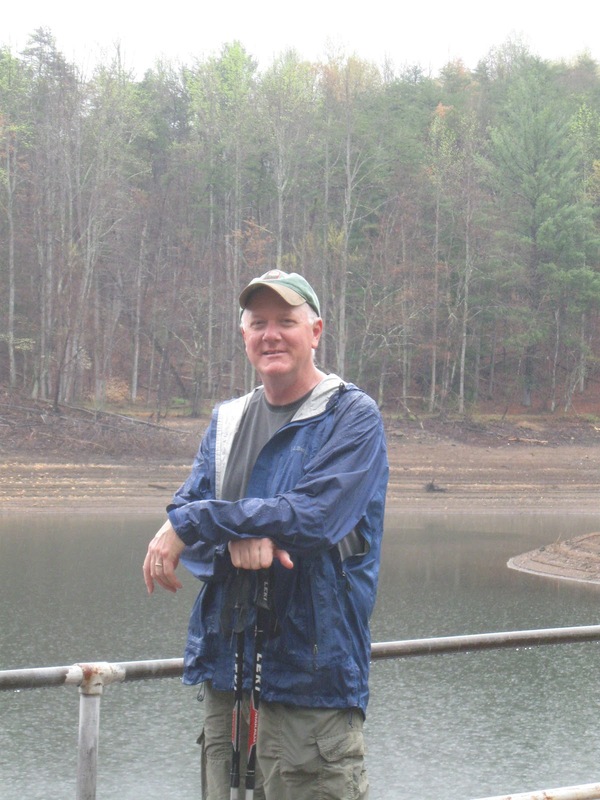 John "Ridgerunner" Brandt happily volunteered to chase them down and reel them back. 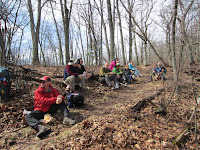 Lunch treats included chocolate (Bill), Girl Scout cookies (co-hike leader Andy Willgruber) and fabulous home-baked cookies (Iva). The hike resumedth a fairly steep descent to Skyline Drive at Beahms Gap. 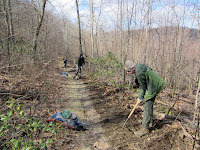 At this point, Lindsay Brown, Neil McKinney and Don Davis returned from whence we came to Panorama. 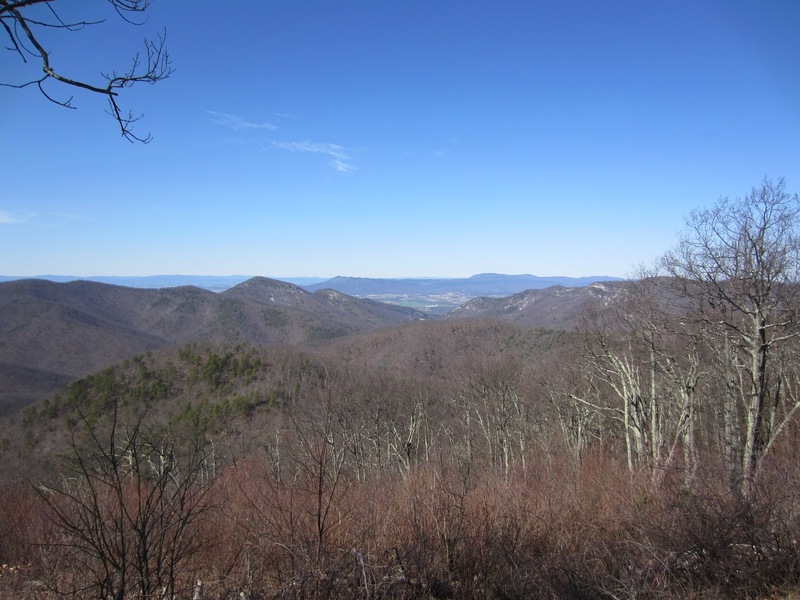 The rest of the hike was fairly gentle and did feature ridgetop views that Marie Moss enjoyed. 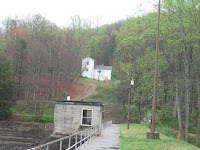 Those hiking in front hiked the AT around the picnic area and to the Drive. 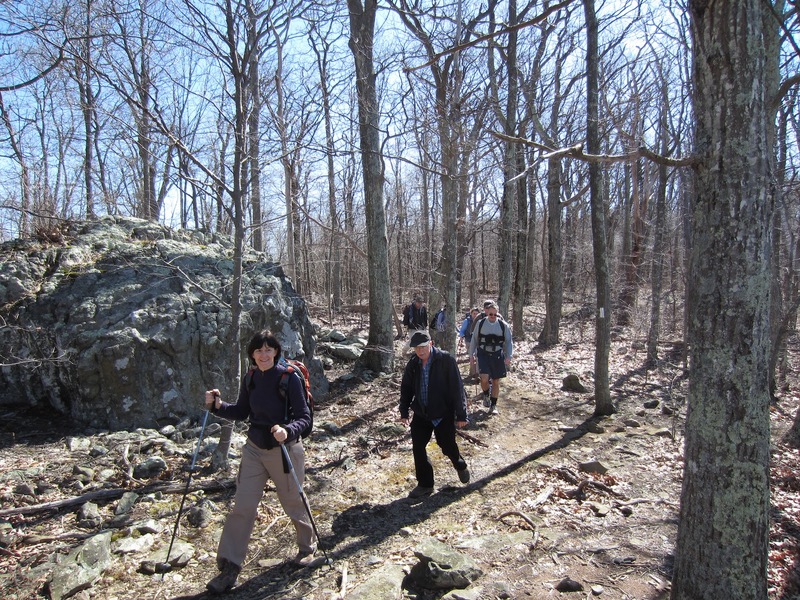 John, Andy, Bill and Marian Styles took a slight detour at the end of the hike to tour the Elkwallow picnic area. 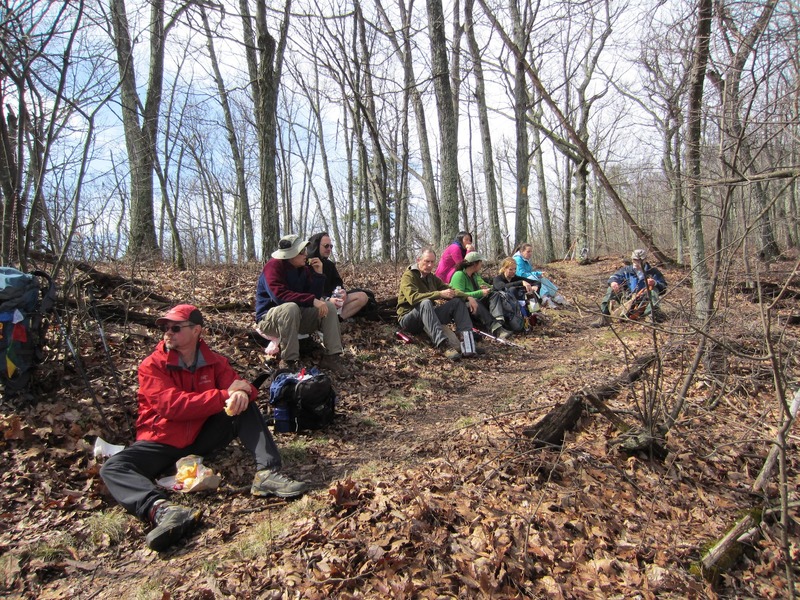 The almost nine mile hike ended at Elkwallow Wayside. A much needed impromptu stretching session broke out. Dan had brought champagne for a toast (yes, real champagne), too! 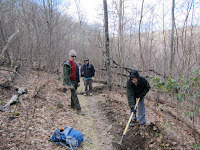 Iva, Dan R. and Michael had just completed all of the A.T. in the SNP. CONGRATULATIONS!!! 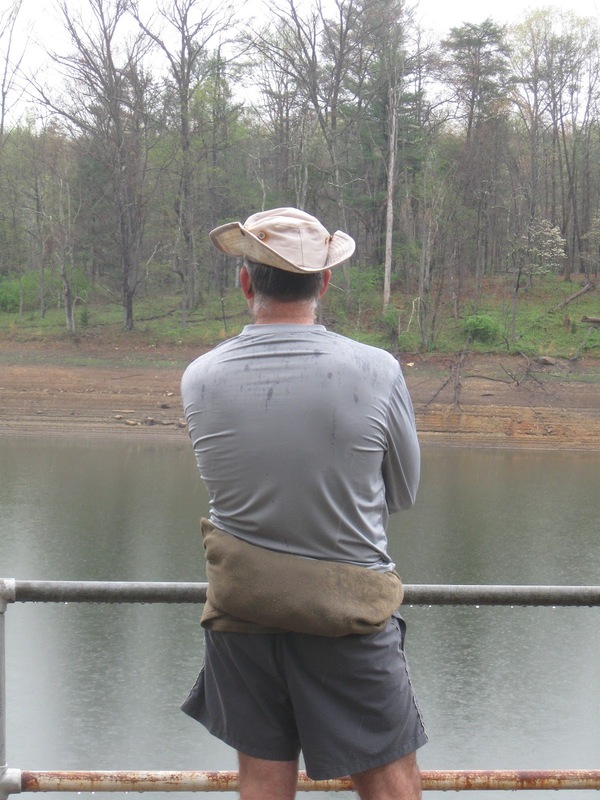 The weather forecast for Saturday had been foreboding for much of the week, and hike leader Ken Moss had some anxious moments in wondering what the weather would eventually bring, but by Friday afternoon it looked like any rain would be gone by our normal 9 AM assembly time. 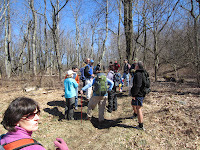 A crowd of eleven hikers showed up at the allotted time, though Marian Styles decided to stay back to search for a wayward John Shannon…a mystery followed with anxious anticipation by everyone throughout the day (he was later found to have participated in an all-day workshop, oblivious to the fact that he had raised such concerns!). 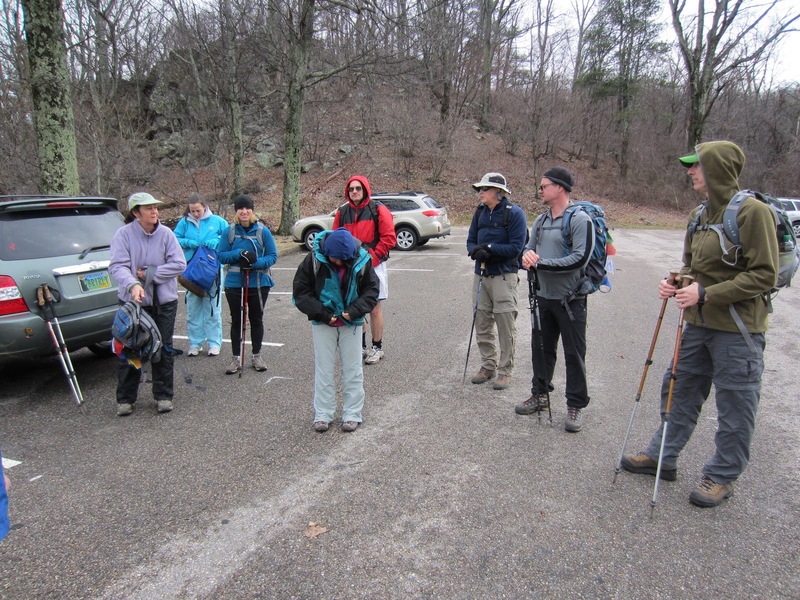 We packed the remaining ten people into two cars and proceeded to Doyles River Parking near the Big Run Overlook, from which our hike began with a descent into the Big Run Watershed, the largest in Shenandoah National Park. 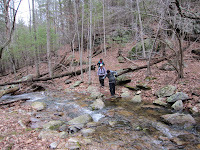 Because of heavy rain the previous night, there was some concern about an eventual crossing of Big Run itself, though this proved unfounded as the water level was quite reasonable. 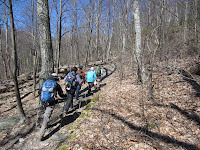 A long slog uphill after the crossing brought us into bright sunshine and a trail junction for lunch, though most retreated from the wind along the ridgeline for a more sheltered location on the lee side of the mountain. 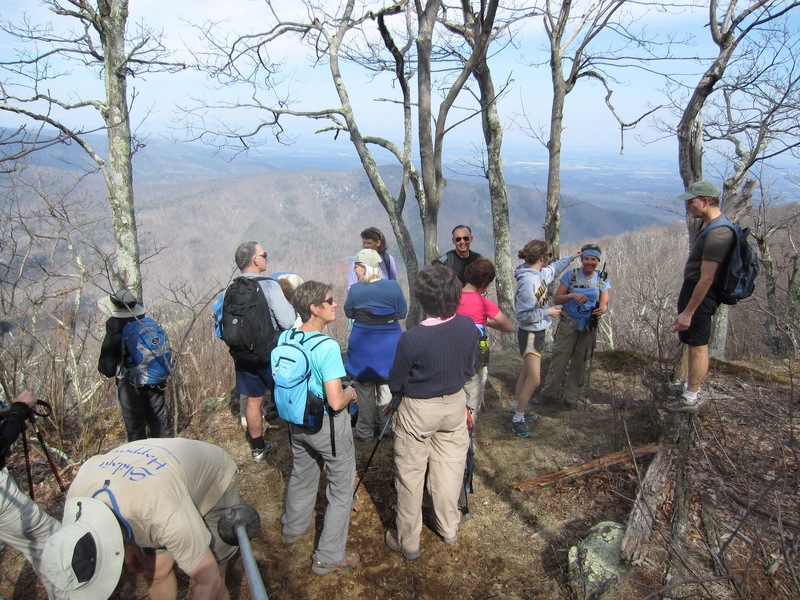 A gentle hike back along the Appalachian Trail via Dundo Overlook, with clear views to the east, brought us finally back to our cars after less than 6 miles on the trail. 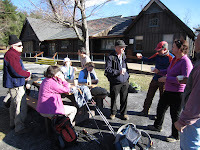 The return trip found all but two hikers eager for a stop at Timberwood Grill on the way home, so those two were shuttled back to the high school while the rest of the group gathered for good food, beverages and lively conversation and one of our favorite watering holes following a good day on the trail. Participating in the trip today were Dan Funkhouser, Steve Cohen, Bill Holman, Dan Ralston, John Brandt, Corina Gendron, Iva Gillet, and newcomers Paige Madison and Lu Jiang. 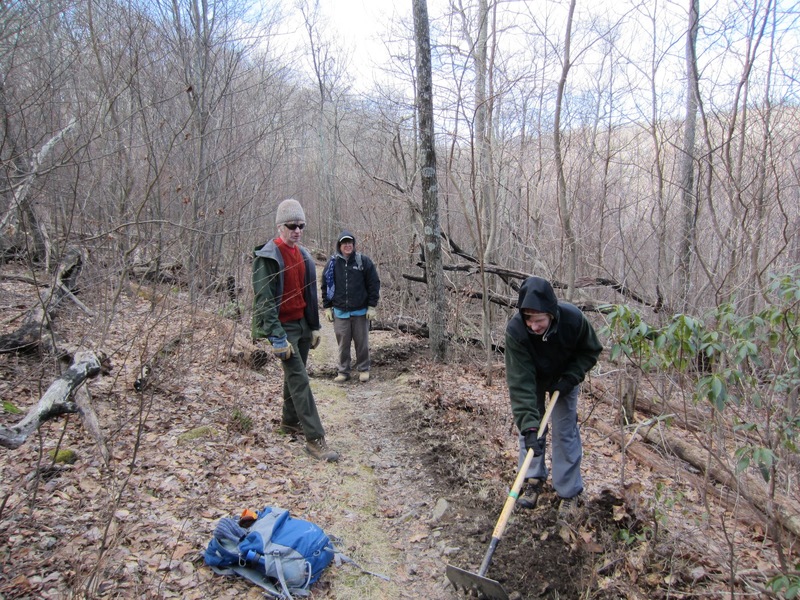 A cold, blustery day was in store for members of the PATC - Charlottesville Chapter trail crew who assembled at Albemarle High School on Saturday morning. 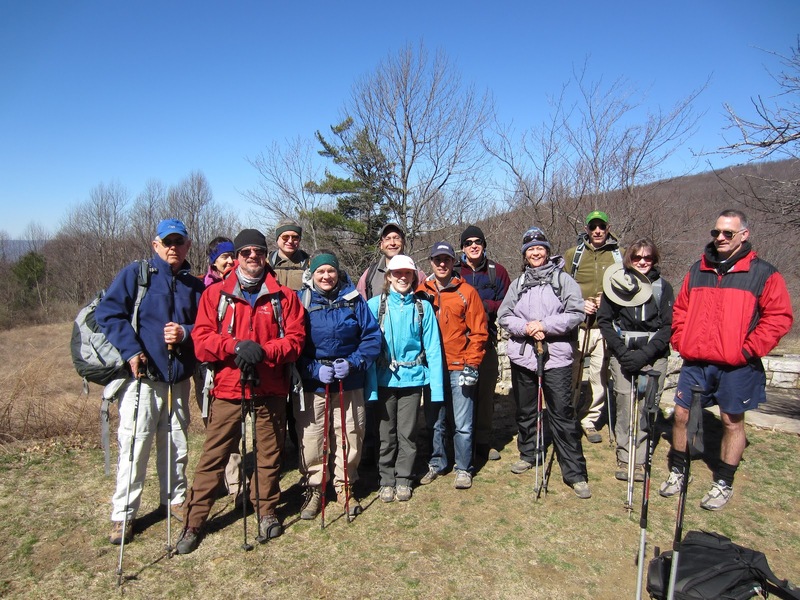 While the weather in town was expected to reach into the 50s, it would certainly be colder in the mountains, though this did not deter these hardy souls. 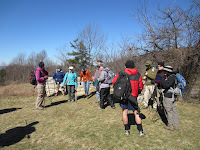 John Shannon led the small group in two cars to the Riprap Trail parking area, from which we would hike a short distance along the Appalachian Trail to work on Lindsay Brown’s section of the trail. 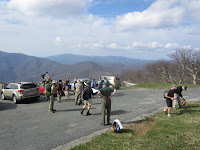 Upon arrival at the parking area Ken Moss noted that the temperature was only 29 degrees and it was quite windy as well, with sustained winds forecast at 15-25 mph. 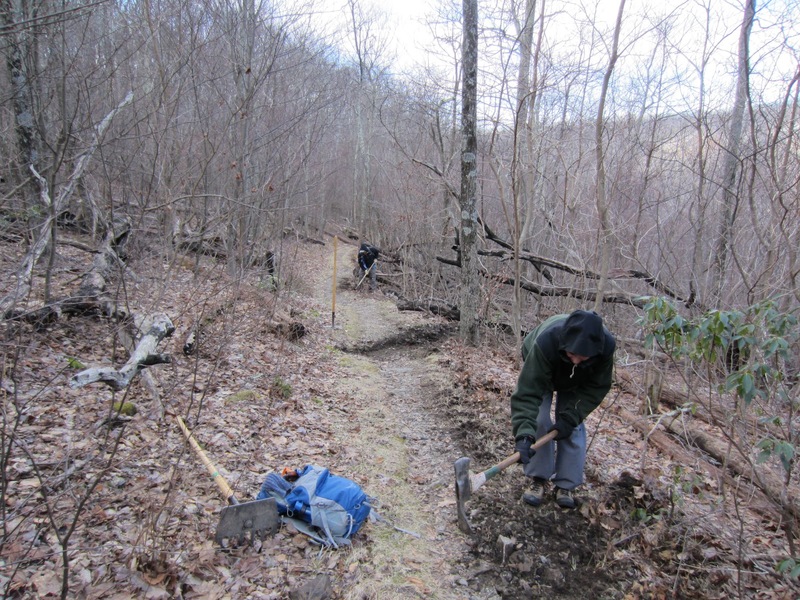 Thus at the median of 20 mph and a temperature of 29, the trail crew, which also included Marian Styles and Don Davis, started working in a wind-chill factor of 16 degrees! 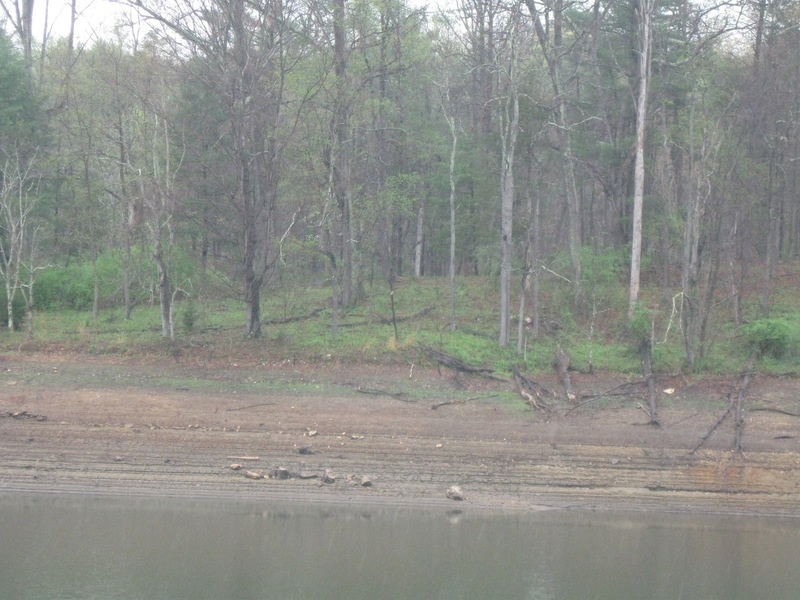 The work John had planned for us was to improve drainage…and thus decrease erosion…on a section not more than 5 minutes from the cars. 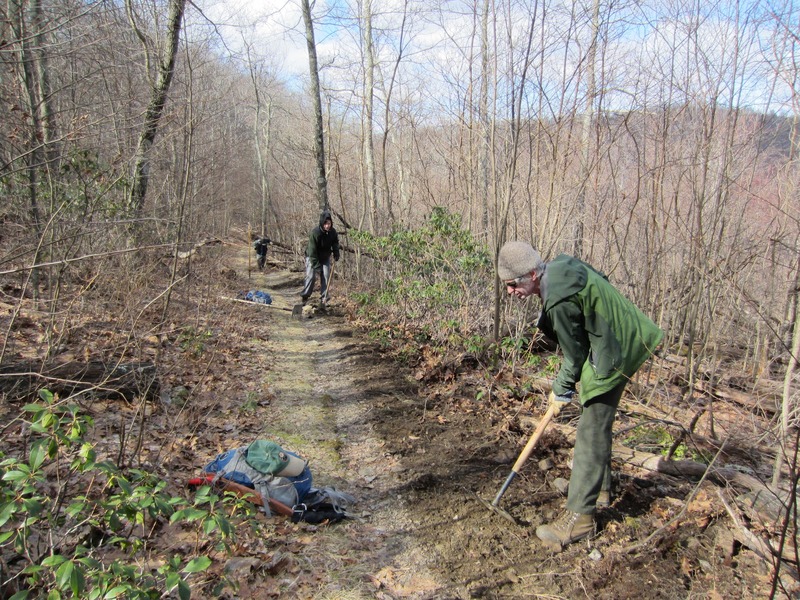 We scalped off low berms on the downhill slope of the trail to allow water to exit more readily and also scalped off some of the slough which had encroached upon the trail over the years from the uphill side. 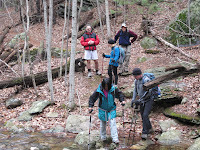 Hand warmers and even toe warmers were put to use in the frigid conditions. After the lunch break, which only meant everyone got colder due to the pause in physical exertion, Marian and Ken left as prearranged at about 12:30. 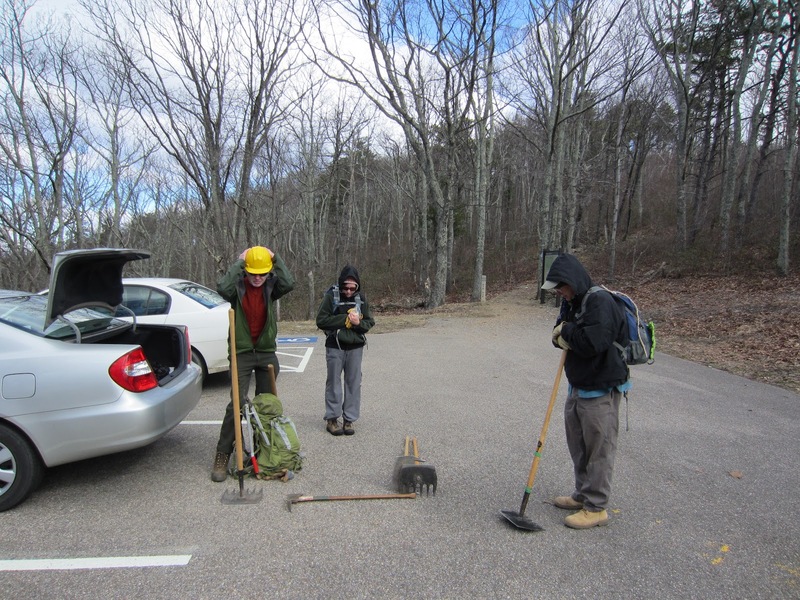 Upon arriving back at the car Ken discovered that it was still below freezing at just 31 degrees, so the wind-chill would have still been in the upper teens. Marian stated that it was the coldest work hike she had ever been on. 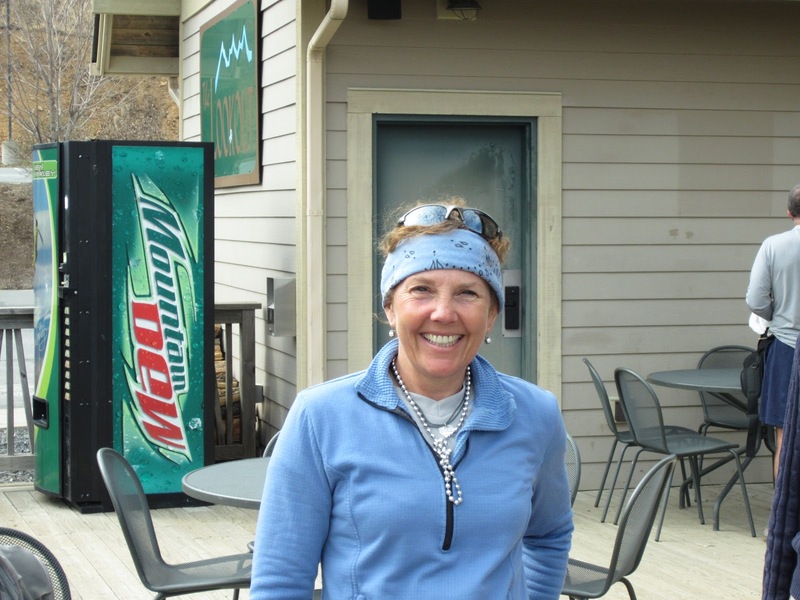 To warm their chilled bones, they stopped by Blue Mountain Brewery on the drive back to indulge in a mug of hot mulled red wine, which warmed them appreciably. 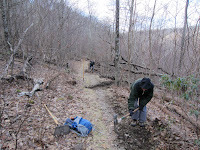 John and Don toughed it out on the trail for another couple of hours before finally retreating to the comforts of hearth and home as well.